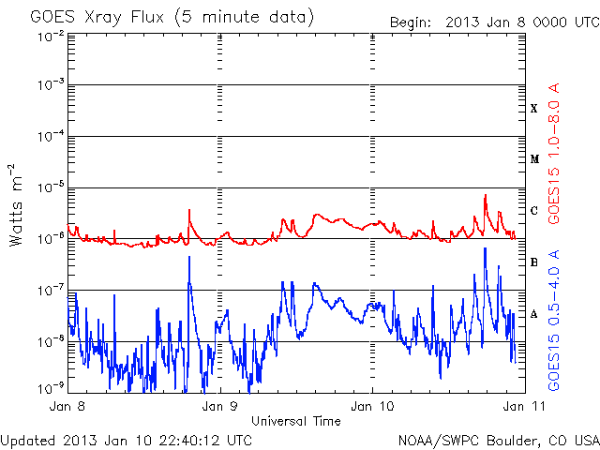 Sunspot 1654 produced a long duration C8.0 solar flare at 17:46 UTC on January 10, 2013. Besides C8 event, solar activity remained at low levels. 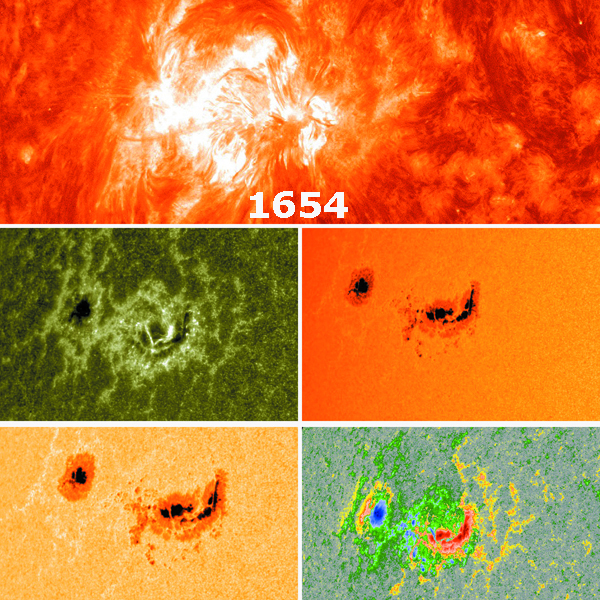 There are currently 9 numbered sunspots with 1652 and 1654 as the largest active regions. Region 1652 is classified as a Beta-Gamma-Delta magnetic group, while Region 1654 remains a large Beta group. There are no large coronal holes on the Earthside of the Sun. Large AR 1654 is rotating into more geoeffective position. This large group consists of two main cores, in which the leader spot appears to be the most complex. Also, a new line of sunspots looks to be forming within the center of the cluster. The two dark cores, connected by a canopy of strong magnetic fields, are each big enough to swallow Earth four times over. SIDC expects solar activity to rise from eruptive to active levels with M class flares likely from AR 1654, and C class flares possible from ARs 1650 and 1652. NOAA/SWPC forecasters estimate 50% chances of M-class and 5% chances of X-class solar flares in the next 24 hours. Geomagnetic conditions are currently quiet and are expected to remain so for the next 48 hours.